Dzanga-Ndoki National Park located in the Central African Republic is a United Nations backed World Heritage Site. The park is known for both forest elephants and low-land gorillas. A large clearing with a mineral water lake called Dzanga Bai, or Village of Elephants, drew between 50 and 200 elephants per day. Dzanga Bai has been a particularly wonderful place to study these elephants since they come there regularly to drink and play in the water. Andrea Turkalo, a member of the Elephant Listening Program, has studied the elephant that come to Dzanga Bai for 18 years. She has identified 3,000 individuals and many family groups. It is not certain whether or not the forest elephant is a subspecies of the African elephant or a separate species. There are some significant differences. For instance, the forest elephant has a longer, narrower jaw, straight tusks, and more toes on its front (5 vs. 4) and back (4 vs. 3) feet. Forest elephants come in different colors. Yes, not just grey, but also red, brown, calico, and most impressive a magnificent shade of bright gold. Unfortunately for forest elephants, their straight, pink tinged tusks are harder than that of other elephants; and so are in greater demand by poachers. The Central African Republic has been in turmoil since December 2012. In March of this year, the Seleka Rebel Coalition overthrew the government and took control, but has made no effort to do any sort of peacekeeping. More than 37,000 people have fled to the Democratic Republic of Congo, others to Chad and Cameroon. The offices of the World Wildlife Fund have been looted so often since March of this that they have removed their personnel from the park. South Africa has withdrawn 200 of the 600 soldiers it had supplied for protecting the park. The defense minister indicated that the troops were not prepared to face poachers armed with mortars and state of the art Kalashnikov assault rifles. There is grave concern for the 3,400 forest elephants that live in the park, since poaching has become rampant. The number of elephants found in the park has declined 62% in the last ten years. Heavily armed gunmen, who claimed to be members of the Seleka Rebel Coalition, entered the park and on May 9, 2013, and used scientific observation platforms to kill at least 26 elephants including four calves. They then hacked off the tusks and left the park. People from nearby villages salvaged the meat from the carcasses and it is being sold openly in local markets. No elephants have returned to the site since the massacre. The demand for ivory in Thailand and China, where trading of ivory is legal, is thought to be among the reasons for the increased poaching that has occurred since March, but the lack of security in the park also provides the poachers with unique opportunities to slaughter the animals. The Prime Minister of Thailand, Yingluck Shinawatra, has promised to change the laws concerning the trade of ivory within her country; China has also committed to banning the sale of ivory. Neither country has yet done so. Today there are no elephants in the Elephant Village. No elephants come for water. There are no elephants to study. Dzanga-Ndoki National Park, World Heritage Site, has been desecrated. The first part of this article explained most of the certifications and criteria that make Oregon wines green. This article is about what wineries do to earn these certifications. As the types of certifications grew in number, what they stood for became increasingly confusing to consumers. The Oregon Wine Board, in an effort to make it easier for consumers who wanted to buy green wines to do so, developed Oregon Certified Sustainable Wine so consumers only need to look for only one symbol. This symbol means that both the vineyard where the grapes were grown and the winery where the wine was made have been certified sustainable. In addition to these there are many others that have one or more of the individual certifications. Seventeen wineries have completed the Carbon Neutral Challenge process to reduce their carbon footprint to zero. As of 2010, there were 848 vineyard and 418 wineries in Oregon. The National Agricultural Statistics Service, part of the U.S. Department of Agriculture, indicated in its 2011 Report that 17,500 acres of grapes from 72 grape varieties were harvested in Oregon. This is an enormous amount of land, all efforts made to reduce the impact winemaking has on the environment on this scale can’t help having an impact. Sokol Blosser, one of Oregon’s oldest vineyards/wineries founded in 1971, was the first in the U.S. to receive Leadership in Energy and Environmental Design (LEED) certification for its gravity-flow winemaking techniques, energy-efficient heating and cooling, and waste-water reclamation to reduce negative environmental impact. Sokol Blosser is also certified organic by Oregon Tilth. Stoller Vineyards is the first LEED Gold Certified vineyard with its amazing gravity-flow winemaking techniques; energy-efficient heating and cooling, and waste-water reclamation to reduce negative environmental impact. King Estate winery has more solar panels than any other winery with 4,000 panels on just four acres. They produce enough energy to run the winery and produce enough extra to power 100 homes. Soter Vineyards, one of the wineries to complete the Carbon Neutral Challenge, has increased recycling and composting; installed solar panels and a more efficient cooling system for fermentation tanks; reduced weight of the wine bottles by 50%; and retrofitted pumping systems with energy-efficient motor as a result of its participation in that program. Willamette Valley Vineyards was the first winery in the world to use cork certified through the Rainforest Alliance to Forest Stewardship Council (FSC) standard. From its beginning Willamette Valley Vineyards has managed the vineyard to control runoff and erosion. One of its more unique features it that it gives its employees a gallonage stipend of biofuel to use in the cars they use to commute. Providing an organic garden for employees and other employee benefits. Oregon’s wineries have become green and are passionate about it. They encourage each other to try new things and adopt new practices. With its 15 approved winegrowing regions, Oregon is likely to be a favored place for growing grapes with an eye toward being kind to our Mother Earth for years to come. Oregonians are a quirky group. We are fiercely independent, innovative, concerned about the environment, and above all else, we are passionate. It seems that Oregon wineries are into being green! When I began looking at Oregon’s green wineries the first thing I needed to understand was, what people generally mean when they say green wine. A green wine has one or more of these traits: the grapes were organically grown, the vineyard used biodynamic practices, the wine is in environmental packaging, the wine is transported and shipped in environmentally friendly ways, and the winery that made the wines has an environmentally friendly infrastructure. A simpler statement is that a green wine is made in sustainable, organic, biodynamic, and/or natural ways. When used to describe wine, the word sustainable means that the wine is made with a focus on three things: environmental stewardship, economic profitability, and social and economic equity. Organic is a term with which people in general have become familiar. It means that no fungicides or pesticides are used in the vineyards. Crop rotation, cover crops, compost, and biological pest control reduce the need for both. Both biodynamic and natural are terms that have meanings specific to the wine industry. Biodynamic wineries and vineyards treat the vineyard as a self-sustaining organism. Herbs, minerals, manure, and composts are used instead of their artificial counterparts. The well-being of all the integrated parts of the vineyard is considered in any action. Natural means that nothing is added and nothing is removed from the wine. The wine is made without additives, using native yeasts, and with only minimal or no filtration. A number of organizations oversee and encourage green wine making in Oregon. There are currently 6 certificates available: Salmon-Safe, Live- Or LEED-Certified, Solar Power, Carbon-Neutral, Social Charities, and Organic/Biodynamic. One part of the work of the Oregon Environmental Council is to help the wineries reduce their carbon footprints. Low Input Viticulture & Enology, Inc. (LIVE) is among the oldest agencies, having begun certifying wineries in 1999. LIVE not only certifies that a vineyard/winery uses sustainable vineyard practices and actively works to be a good steward of the land, but it is also involved with issues concerning worker health and safety. In addition to its own certification, LIVE has become an umbrella group for Salmon Safe (which certified its first vineyard in 1996) and Oregon Certified Sustainable. LIVE also administers the Carbon Reduction Challenge. Leadership in Energy and Environmental Design (LEED) certifies that strategies were incorporated into the vineyard and winery that protect human and environmental health. These strategies might include ways to save water, be more energy efficient, and maintain indoor environmental quality. Oregon Tilth is a nonprofit organization that supports and promotes biologically sound and socially equitable agriculture through sustainable approaches to agricultural production, processing, handling, and marketing. Oregon wineries are serious about being green. They are making exciting changes that will have a lasting impact on Oregon. Americans have become huge consumers of energy. Our lives rotate more and more around activities that use electricity. The question is, “Where will the energy we have come to depend upon come from in the future”? The Oregon Department of Energy (ODOE) was established in 1975 with a daunting mission. ODOE is supposed make sure that the people of Oregon have affordable, uninterrupted sources of energy. It is to help the people learn to conserve energy, develop clean renewable energy sources, and clean up waste generated by past power sources. Currently ODOE supports the exploration of several new sources of energy: solar, wind, wave, geothermal, and biomass. 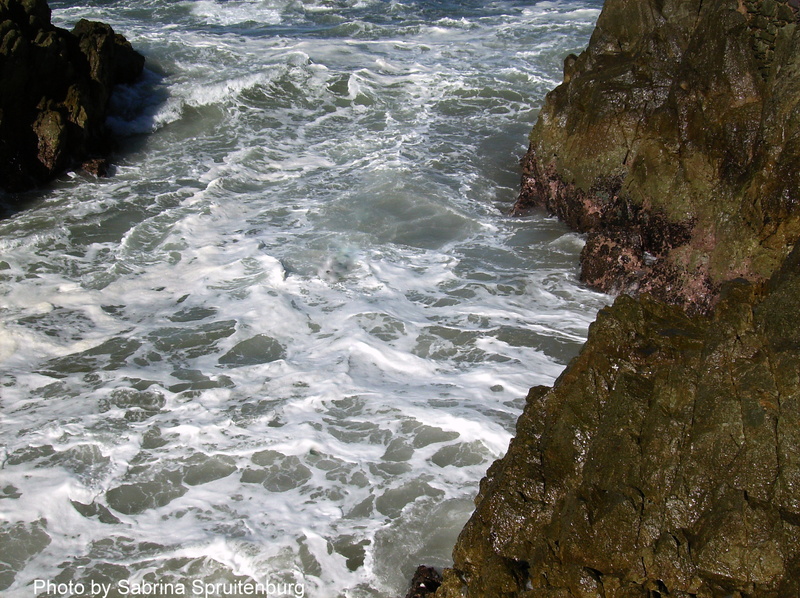 Capturing wave energy is in its infancy in the United States. Europe is much farther along at developing this energy resource than the U.S. Beginning in 2000, interest in harnessing wave energy began growing in Oregon. More than $15 million has been spent on preparing to utilize this resource. It appears to be a nearly perfect renewable resource; yet it is rapidly becoming a source of contention. The areas required are enormous – one company asked the state for the use of 7,000 acres to search for a place to locate its converter. Not only that, but the converter would stand three stores above the ocean’s surface and occupy a space 70 feet by 1,400 feet. These converters need to be located within a few miles of the coast, causing difficulties for fishermen and eyesores for tourists. The development of wave energy is surging ahead without having guidelines and rules in place. There are many unknowns at this point such as how will the magnetic fields produced by the converters effect migratory birds, fish, and animals. A site two and a half miles off the coast of Reedsport has already been prepared. A PowerBuoy is in the final stages of assembly, and will soon be towed to Coos Bay where it will be rigged for deployment. When that is complete it will be moved to its destination and connected to the system already in place. During a trial period of unknown length, the PowerBuoy will use its computer system to adjust to the changing wave motion and provide data to engineers. Eventually the company wants to have ten buoys in a ‘wave park’ at this location. Interestingly, hearings will be held on the project beginning Oct. 25 at Reedsport City Hall. Everyone is familiar with this type of energy. We use it when we burn wood to heat our homes. Biomass is actually any type of organic material: wood chips, pulp sludge from wood-processing facilities, agricultural crops, and animal manure just to name a few. Biomass can be converted into electricity, steam, or gas. It can be used to produce methane, ethanol, biodiesel, or methanol to run machinery. Most exciting is the fact that it can be used in place of petrochemicals to make clothing and plastics. Many people are concerned about the carbon that is released when biomass is processed. However, if new plants are planted to replace those processed, they will remove the carbon from the atmosphere. Producing biomass energy is considered carbon neutral for this reason. The concern for scientists is that crops to produce biomass energy will replace crops needed for food in underdeveloped countries. Additionally, care must be taken to reduce the impact harvesting these crops have on the land. There are several biomass converters in Oregon that together produced over 27 trillion Btu. There is only one plant in Oregon that converts municipal waste to electricity. It has been operating since 1986, in Brooks. It is estimated that the facility produces about 1.7 trillion Btu and generated 99.2 million kilowatt-hours of electricity. There are several places in the state where geothermal energy is used to heat to buildings, swimming pools, and resorts. Currently, there is no electricity being generated from geothermal energy in Oregon. It appears that will be changing in the near future. U.S. Geothermal Inc. plans to complete a 26 megawatt plant at Neal Hot Springs near Vale. In 2013, Nevada Geothermal anticipates having a 30 megawatt plant at Crump Geyser near Adel. Wind energy seems like it would be a clean energy source. During 2011, over ten percent of the state’s energy came from wind farms. However, some pollution is produced in the manufacture of the turbines that produce the energy. The turbines mar the landscape and produce a great deal of noise. Worst of all, winds are unpredictable; sometimes they are storm strength and sometimes they are still. The turbines, when located on raptor migration routes, confuse the birds and they become lost. A small number of bats are killed by barotraumic stress (reduction in air pressure that damages their hearts and lungs). Unfortunately, bats are killed by the white noise produced by the turbines, over 300,000 bats in a single cave. Solar power seems to be the cleanest of the emerging power sources. Environmental groups would like Oregon to be getting ten percent of its energy from solar sources by 2025. This seems entirely possible since Germany, which produces more solar power than any other country, has less sunlight per year than Oregon. While Oregon leads the nation in solar manufacturing, it does not implement this technology on any meaningful amount. However, solar energy does have downsides. Although solar units can be installed on top of existing buildings and built into new constructions, true solar farms take up a lot of space. It would take a 100 mile square of land in a place like Arizona or New Mexico to provide enough solar energy for the nation. The environmental impact would be tremendous, unless land already damaged by mining or other such functions could be utilized. Strategies need to be developed to deal with the inevitable damage to solar panels, which contain oils and molten salts that are hazardous, before any large-scale production of solar energy can be undertaken. New ways of producing energy are being developed that have the potential to replace the use of fossil fuels in the production of energy. In our everyday lives Americans consume tremendous amounts of electricity. In order to maintain our standard of living into the future, Americans need to develop conservation methods and utilize other methods of producing energy as soon as possible.